First built around 1940, Building 99 has been exposed to both low and high temperature testing, the effects of which are now visible on the building fabric. This consolidation exercise will select the best of the three existing chasis dynamometer cells for refurbishment as the only working test cell, the remaining cells will be stripped out and converted to storage facilities. Detailing of the improved external fabric and internal thermal lining is also to consider improving the air tightness of the selected CD cell to improve the efficiency of the facility, and reduce the loads placed on the refurbished plant equipment. 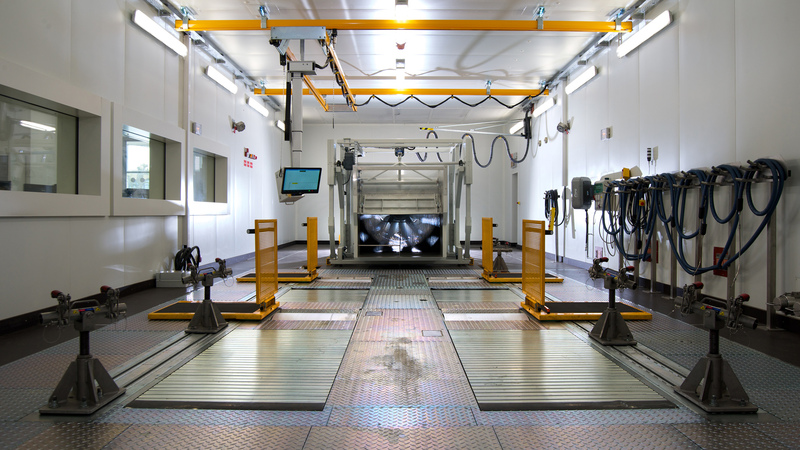 Support accommodation to be refurbished includes the control area which houses emissions testing equipment, office accommodation, fuel stores, and the vehicle soak area. As part of the refurbishment, asbestos is to be removed, fire strategies are to be reviewed, cleaning and maintenance regimes developed to be simple and safe to execute, accessibility of the facility will be improved, and break out of noise from the CD cell controlled.